some sort of power plant (i see the power lines)? i slept through the first two "what is it?" posts - jet lag! i guessed about the ice house, though. new baby is named Adir. mom says Adir Who (Adir Hu). brings back memories, no? I think it is one of the control structures at one of the locks. I'll see if I can identify it specifically. My guess is a lighthouse. My grandson, Josh(8), thought the "Turtle Tug" was a fishing boat that used nets, but I said "how would they get the nets through doors"?. I told him that his guess was correct. We are having a good time with your "What is it?" pictures. Your updates are now part of our everyday activities. Enjoying your trip. Keep up the good work. Looks like James is right on the money. http://www.cornwallis-images.com/prod5.asp?prod_id=313&id=276&grpid=313&msg=&offset= A pretty neat looking building. Even the name of the road is fun to say! The Campbellford/Seymour Branch of the Trent Hills Fire Department consists of 18 professional volunteers operating out of one station. These volunteers are ready when needed to protect and aid the citizens of our area. Gentlemen, you are correct! 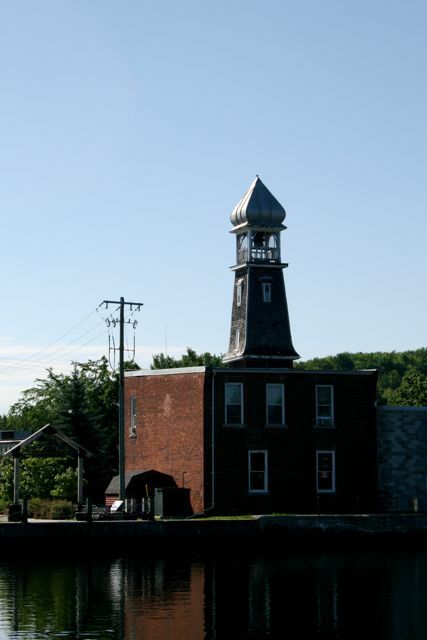 This is the old fire station in Campbellford. NOW, for the big important question: Why does this fire station have a tower that looks like a church steeple? What was that tower used for? I'll attempt a guess without looking for the answer. Judging by the fact that there is very little around it in that black and white photo, I'd venture to say that it was a fire watch tower or some sort of watch tower for the river.